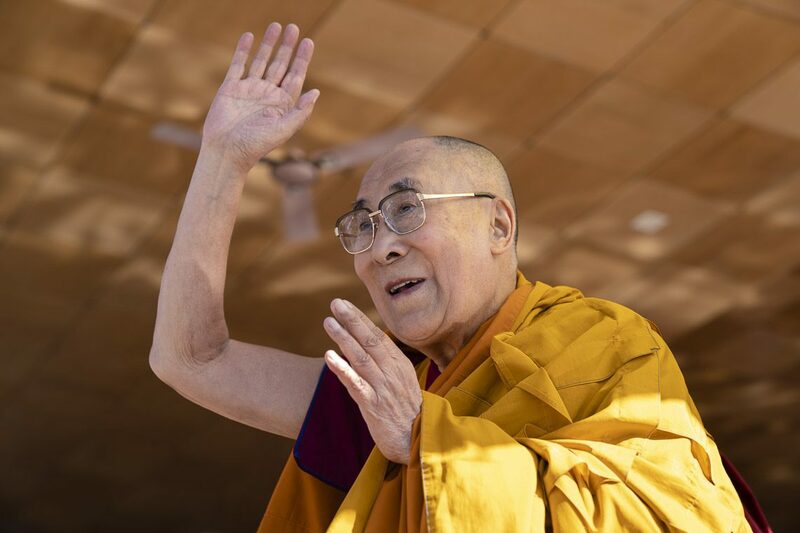 Bodhgaya, Bihar, India – The sun shone low over the Mahabodhi Temple this morning as His Holiness the Dalai Lama left early to walk to the Kalachakra Ground. He smiled and waved to the few people waiting to see him on the road and inside the ground. On the stage he sat on a chair facing the mandala pavilion with a thangka of Vajrabhairava hanging behind it to perform the self-generation rite in preparation for giving the Solitary Hero Vajrabhairava Empowerment. As he went through his procedures, the stage and ground beyond gradually filled with people. 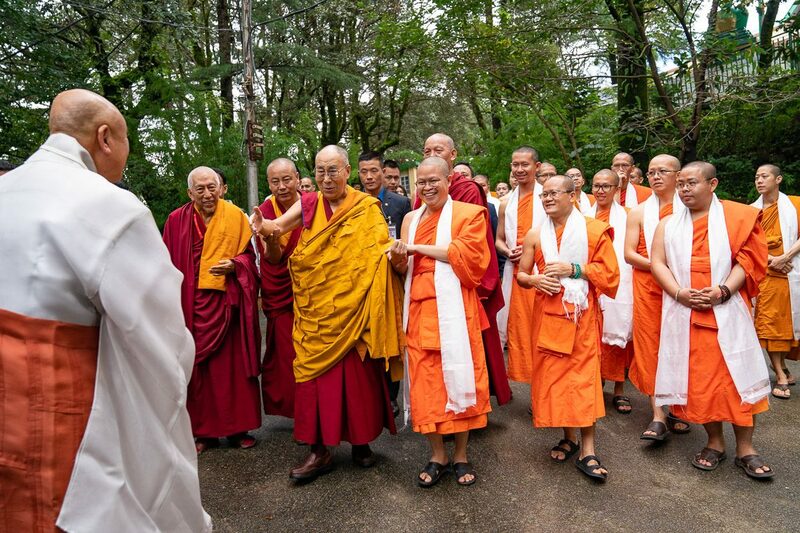 After His Holiness had taken his seat on the throne, Theravada monks once again chanted the Mangala Sutta in Pali. 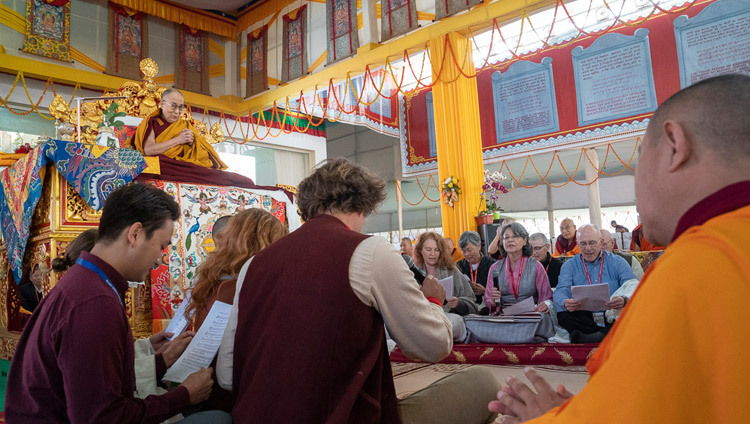 They were followed by about a dozen Westerners who, for the first time in His Holiness’s presence here in Bodhgaya, sang the ‘Heart Sutra’ in English to a musical setting reminiscent of plainsong. The performance attracted applause at the end. 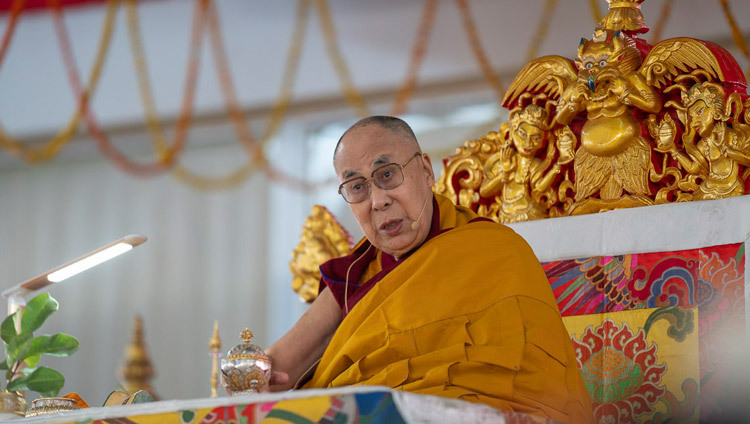 “Today, I’m going to give the empowerment of Vajrabhairava,” His Holiness confirmed, “which belongs to the practice of tantra or mantrayana. Tantra involves such practices as the cultivation of inner heat, recitation of mantras and the use of energies, channels and drops. 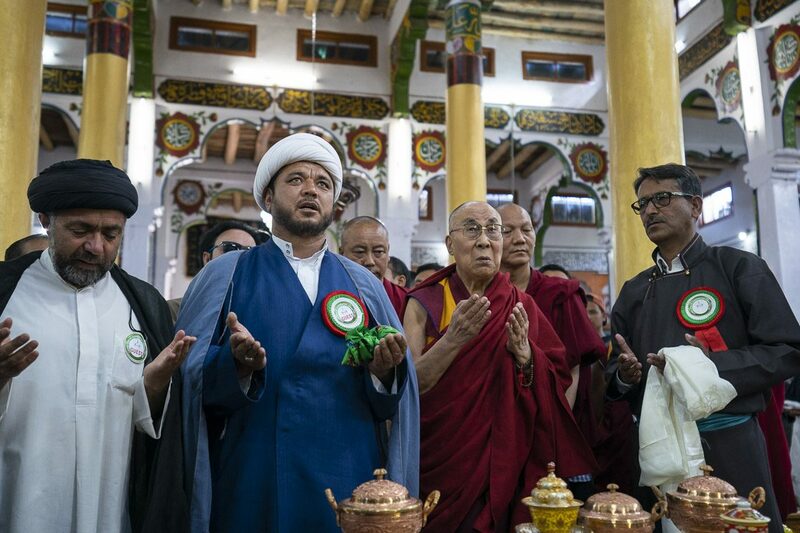 Such practices are also found in non-Buddhist traditions. I’ve met Sadhus who engage in practices for projecting consciousness out of the body. “In the past, there were people who asserted that the Mahayana was not the teaching of the Buddha. Nalanda masters like Nagarjuna, Bhavaviveka and Shantideva answered such challenges. Others suggested that tantrayana was not taught by the Buddha. 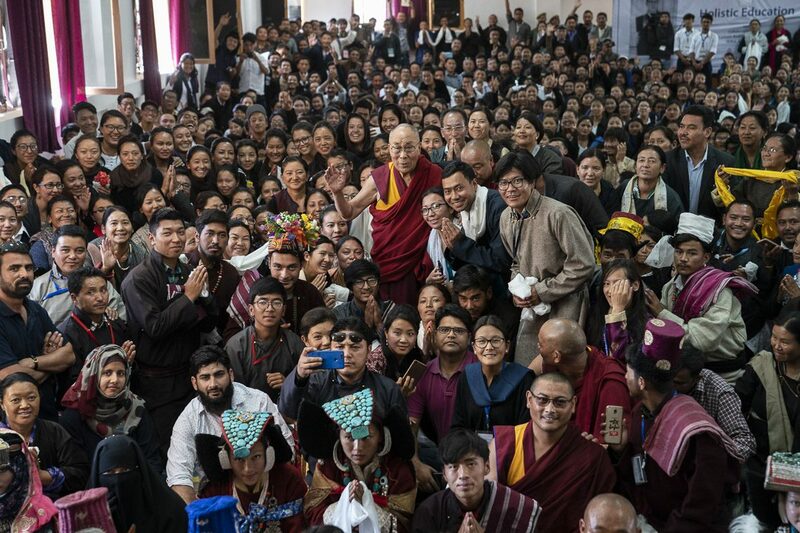 They declared that what the Buddha taught was dependent arising and cultivating concern for suffering sentient beings, whose kindness is likened to that of a mother. “Dependent arising and altruism are part of the general structure of the Buddha’s teaching. Secret mantra, which was not taught openly or in public, was a specialized teaching intended for specific disciples. The writings of the Nalanda masters are part of the general structure, whereas tantras taught by the Buddha who had arisen in the form of a deity were specialized teachings. The distinction was drawn by Nyengön Sungrab a Geluk Lama who studied with Tertön Sögyal, Lerab Lingpa. Tantra, as a specialized teaching, is to be practised in secret. “Mantra defends its practitioners from clinging to ordinary appearances, preventing the mind from being carried away by them. Visualization of yourself as a deity, for even a short time, defends you against seeing yourself as ordinary. Vajra refers to the indivisibility of clarity and awareness. To be effective it requires meditation on emptiness. Tantric rituals commonly begin with the mantra ‘Om svabhava sarvadharma …’ everything dissolves into emptiness and from emptiness arises in the body of a deity. “Impure objects are a result of karma and disturbing emotions; the emptiness of the mind is a pure object. On the basis of the mind of clear light, subtle mind and energy, you can transform yourself into a deity and mandala. Impure objects do not go to Buddhahood, pure objects do. Because it leads to enlightenment, it’s called a vehicle. “The Nyingma tradition speaks of nine vehicles—the shravakayana, pratyekabuddhayana and bodhisattvayana, which are the outer vehicles of sutrayana; kriya, charya and yoga tantra, which are the three outer tantras; maha, anu and ati yoga, which are the inner tantras. Mahayoga corresponds to the generation stage, anuyoga to the completion stage, while atiyoga actualises the mind of clear light by taking pristine awareness into the path. Yamantaka, along with the eight classes of Heruka, arises within Mahayoga. “It is said that enlightenment is not given by anybody. It does come from outside us. It is not possessed by anybody, why? Because the fundamental practice that gives rise to the three bodies is within us. The innermost mind of clear light and the subtle wind energy that is its mount are transformed into the three bodies of a Buddha. “Dzogchen states that when an experienced master has a devoted disciple he can introduce him to the gross and subtle states of mind that arise from pristine awareness. The 7th Dalai Lama said that when your mind can ascertain emptiness, all other appearances diminish and are absorbed into emptiness. 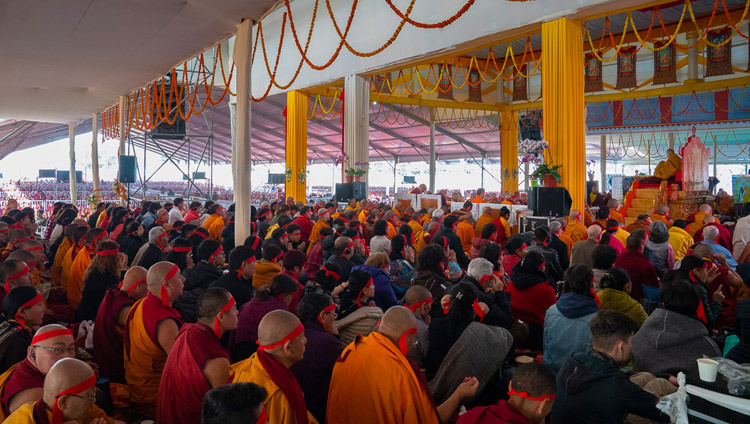 As he began to give the empowerment, His Holiness clarified that Solitary Hero Vajrabhairava was the first empowerment he received as a child and he received it from Tagdrak Rinpoché. 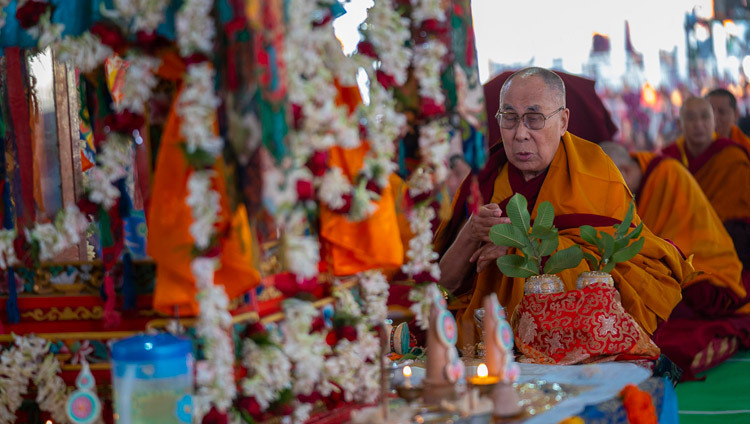 Subsequently, he received it many times from Ling Rinpoché, the last occasion being in the main stupa here in Bodhgaya. Solitary Hero Vajrabhairava was also the principal practice of the 13th Dalai Lama. 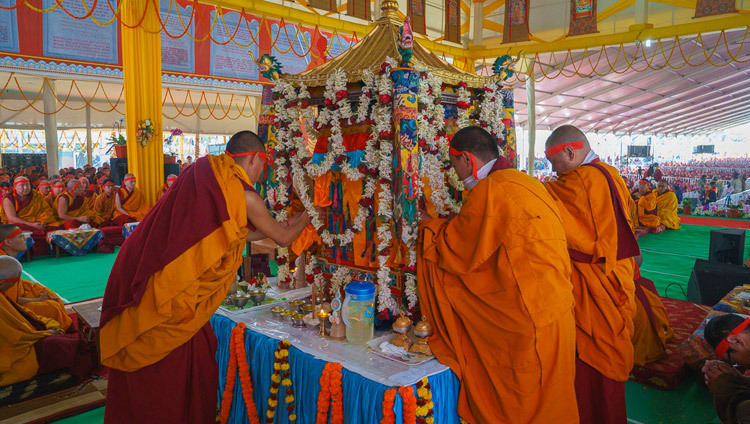 The day after tomorrow, His Holiness will begin to give the cycle of empowerments known as the ‘Wheel of Teachings in Relation to Manjushri’ over a period of three days.